The world at large seems to have embraced the show’s overall meta-aesthetic, as Mr. Robot was immediately renewed for Season 2 before Season 1 even began airing. And Season 1 — out today via Universal on Blu-ray and digital platforms — just snagged two major Golden Globes this past Sunday: one for Best Drama Series and one for Christian Slater as Best Supporting Actor for his role as the titular Mr. Robot. 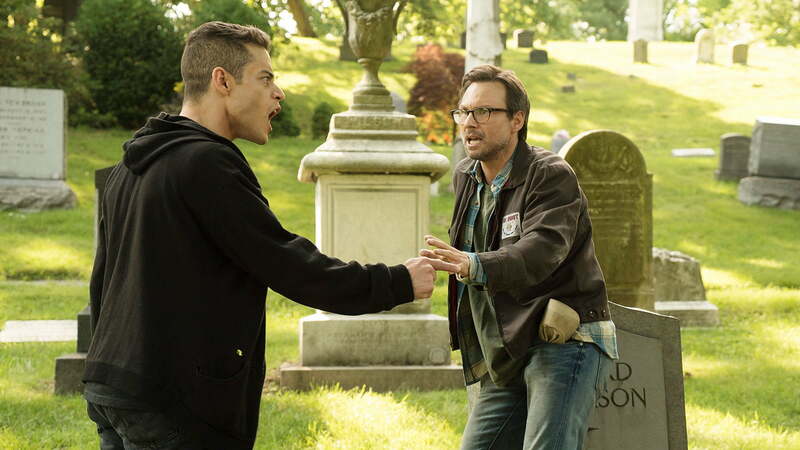 Digital Trends sat down with Mr. Robot’s cast and creator at the New York Comic Con to get the scoop on the show’s impact in the cyber world at large, how the cast and crew may have changed some personal habits because of the show, and what we might see in Season 2. 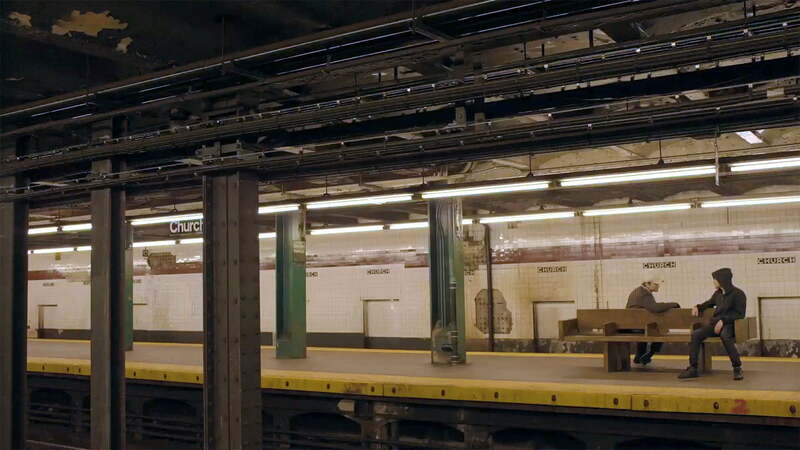 Digital Trends: This is a very visually stylized show, to say the least. How would you like people to watch it? What’s the best way to experience it? 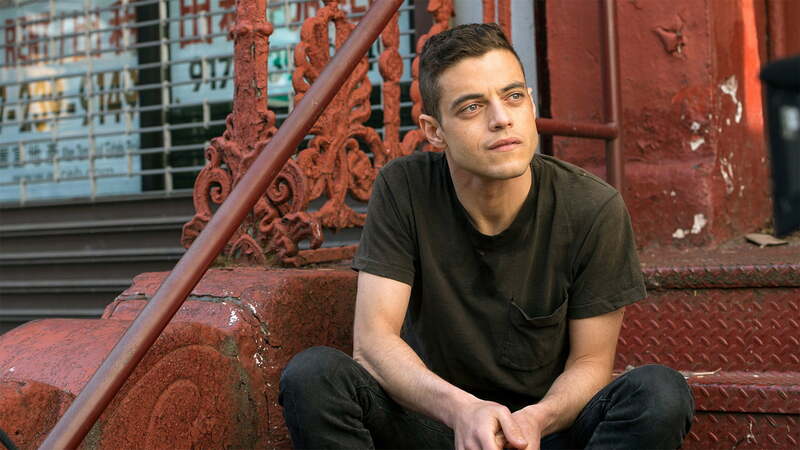 Rami Malek (Elliot Alderson, security engineer at Allsafe Cybersecurity, and vigilante hacker): You know, we say don’t binge-watch it. Take a few days in between. There’s so much to digest. I’d read a script, and I’d go, “Wow. That is dense.” I would take my time before jumping back into it and learning any of it. It’s so heavy and so nuanced, it really needs that extra time. Christian Slater (Mr. Robot): You need to absorb it. There is so much going on. It’s not a multitasking type of show. There are things that happen in one episode that will lead into the next — or one that’s eight or nine episodes down the road. So it is one, I think, to absorb. Let it wash over you. Sam Esmail (show creator): We definitely go for a cinematic quality, especially in our shots and our framing. It lends itself to a really big-screen experience. Mr. Robot is a show that has a rep for not pulling any punches, would you agree? Martin Wallström (Tyrell Wellick, senior VP at E Corp): Yes. I’ve heard that people think this is the one show that is really critical about the world we live in, in the USA. A lot of people can feel that. And we don’t use fake brands — we use real brands. We name names. So I think that is refreshing to people, and they really appreciate that. Maybe that’s one of the reasons it’s hitting the pulse. Any hostility from those you’ve called out? Esmail: Not yet. Well, I do get a lot of Patriots fans hating on me (chuckles). Here’s the deal, though: It’s all told through the lens of Elliot’s world and the universe of our story. I don’t think they take it personally, though we are incredibly critical of the capitalist system. It sparks a conversation, which is what our goal was. 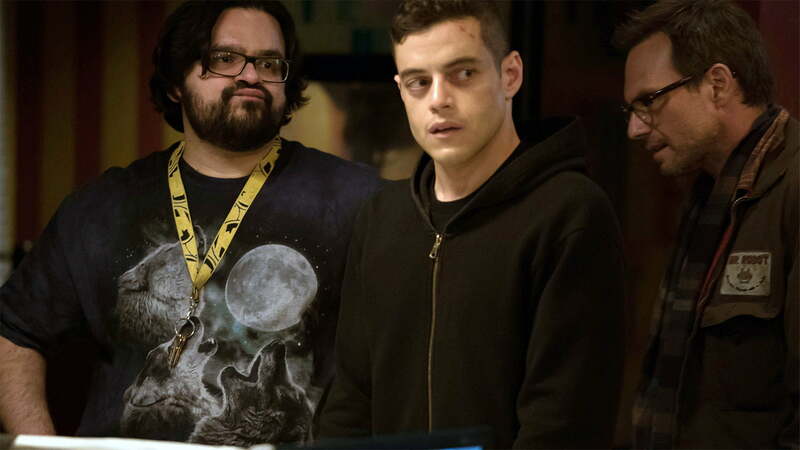 Slater: Sam Esmail had a unique take on this particular world, which was to do it as authentically as possible. In other situations where people are trying to take on the world of cybersecurity, it’s all about zooming down the cable and going into the computer with a lot of CGI and special effects. They think, “Well, it’s the computer, so let’s do a lot of CGI.” We handle it in a much more realistic, authentic way that really hadn’t been tackled before. I like that, in addition to the way the show looks at technology, its characters are also deeply developed. Esmail: We have an edict in the writer’s room to always try to find the unexpected, and add consequences to our characters’ actions. We’re trying to avert expectations as much as possible. Typically, you would see a villain very much in control, but here, it’s the complete opposite. I just think it’s a lot more interesting. Portia Doubleday (Angela Moss, childhood friend of Elliot’s and a fellow employee at Allsafe): Sam is so lenient, and so collaborative. I’ll ask him, “What is this scene? I don’t understand it.” And he’ll actually come over and talk it out: “You know what? This works, and this doesn’t, so let’s try this, and not that.” That was so extremely helpful — not feeling like you have this weight on your shoulders and you have to do it all by yourself. Carly Chaikin (Darlene, fsociety hacker): The most interesting thing to me is when Portia and I were doing one of our scenes, I had a misconception about what she meant when she said, “You guys were never really that close,” about my character and Elliot. That’s what I’m interested in finding out — what it was like growing up before we started fsociety together. Is it fair to describe your characters as “21st century punks”? Slater: We’re anarchists, yeah. As a result of doing this show, it’s certainly raised my level of awareness as to that culture — the people out there looking into the different hacking organizations, the Anonymous, and seeing the types of rebellious thing that they’re doing. I’ve been asking myself, “Am I a fan of this sort of culture?” I like the moments where things are exposed where human beings are being taken advantage of. For the most part, that feels like what’s been going on, so at this point, I can say that I’m a fan. Has working on this show made you more paranoid? 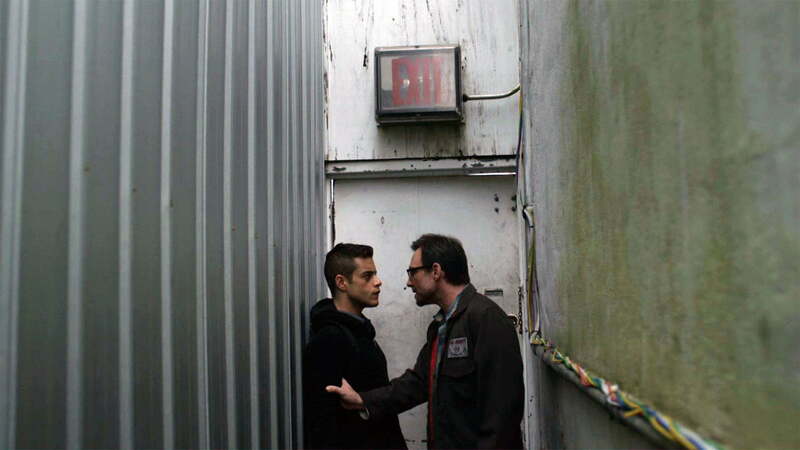 Malek: (nods) Passwords, and microphones — I don’t like microphones (chuckles). I hate this (points at digital recorder). This scares me. You will have this conversation for the rest of your life. At some point, you could use it against me. I’ve given you a bank of words in the way that I say them, and that could be used to hurt someone. That’s the kind of stuff I never thought about before. Slater: And now you have my voice too. Is it terrifying knowing what we are capable of doing as a society? Rami: I think it’s more terrifying not knowing. Slater: Yeah, that’s true. Yes. How close is the show to reality? Esmail: Everything we do in the show is very grounded. A lot of the hacks come out of the things we’ve researched to be true and have actually happened, including the prison hack. There’s a real white paper on how to hack a prison and cause a prison break. The one fictional thing is we created a conglomerate (E Corp) that owns 70 percent of the consumer credit industry. That doesn’t exist… yet. Hopefully, it will never exist. I always say we’re making a show of today. It’s like a period piece of our modern-day society in the context of its technology. Did you have to take a crash course for learning all the jargon in this world? Slater: Learning a lot of the terminology was challenging, and disconcerting. The first scene Rami and I had was on the Ferris wheel together on the first day of shooting. We spent the whole day together — 8 hours on this Ferris wheel, getting to know each other. I, of course, wanted to show up and be as prepared as possible, and I had to learn a lot of terminology. I came in for rehearsal 3 days prior. I was really ready, and as up to date as I could possibly be. And then 2 hours before we went in to shoot the scene, a lot of the terms I had already learned were outdated. It’s a world that is always evolving and always changing. That’s really one of the challenges. How far in advance did you know about the deep plot twist, which we won’t spoil here? Chaikin: I knew from the beginning, about all my stuff. Yeah. Malek: We both knew from the start. Malek: Sam asked us how much we wanted to know, and we both said we’d like to know everything. So he told us, and it helped. For me, I had to make Elliot as real and authentic as possible. I loved it, and I didn’t know any different. To never question his existence was something that helped me throughout the season. Chaikin: Obviously, I met with Sam, and we talked a lot about what was going to happen. Season 1 was kind of a discovery period. 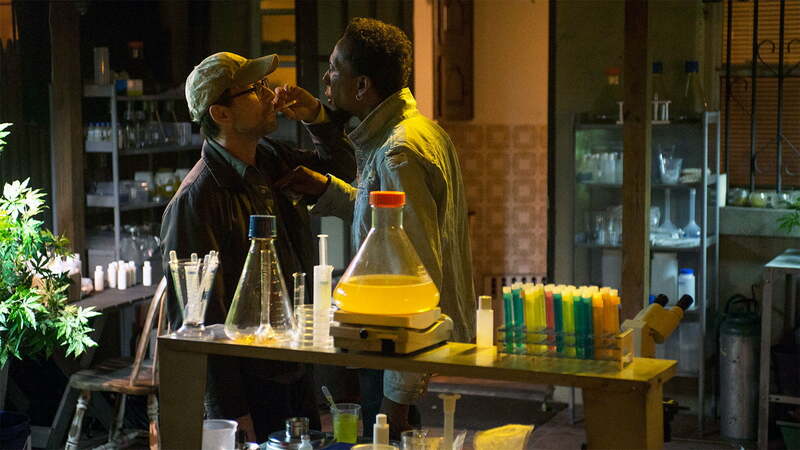 Going into Season 2 is easier because I feel more confident in who I am as Darlene. There’s still the surprise, because we don’t know what’s going to happen. Doubleday: I knew what my arc was going to be before we started shooting, but I didn’t know what it was going to look like. That’s the good thing about being on a show like this — I’ve never been on a TV show where I’ve gone through such a drastic change. And with Sam, you actually don’t know what’s going to happen. I was just asking him, “So, now what?” It can go in any direction. But what’s great about doing a TV show is you get to learn about your character as the show progresses. That can sometimes be overwhelming, because when you’re doing a movie, you already know. So you prepare — this is what you have, and this is where you’re going. Esmail: Season 2 gets really dark, really fast. It’s even darker (smiles). We’re still nervous with every episode. We’re afraid people are going to hate it and call us out as frauds, or whatever. But we definitely love the attention.